Today is the third of November and the third anniversary of Silvia’s death. 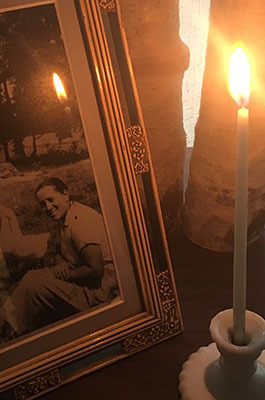 This morning, I light a slender white candle for Silvia at my desk, watching its bright flame rising from a slip of blue, a color she seemed to favor in her gardens. The candle briefly topples, but I catch it, the flame still steady, wavering only slightly, and I think of Silvia, a lifetime of barely wavering, even when the world around her toppled again and again. After Silvia died, a single obituary was written. It was published in the monthly, town newspaper, written by someone who knew her and clearly cared for her. On this third anniversary of Silvia’s death, I write this remembrance. Silvia Narma was born in 1918 in Paide, Estonia, the birthplace of her mother Johanna Nichtig (Glase). Her father Juhan Narma (Nichtig) was involved with business and was the director of a daily newspaper. He was later appointed Economy Minister of Estonia. Johanna, Silvia’s mother died when Silvia was nine. Soon after, her father Juhan remarried, Johanna Narma (Sander). When Silvia was twenty-three, her father, Juhan, was arrested by the Soviets, as a political prisoner, and sent to Tavda Prison Camp, where he died the following year. Silvia’s stepmother Johanna died two years after her father in 1944. At this time the family was living in Tallinn, the capital city of Estonia and Silvia was studying international law. With the Soviet invasion, in the autumn of 1944, Silvia, along with 70,000 refugees, fled Estonia. Silvia was separated from her family, but escaped into Germany where refugee camps were established. Not long after arriving in German occupied territory, Silvia was taken to the Auschwitz concentration camp (See addendum below). After liberation from Auschwitz in 1945, Silvia was reunited with her younger brother, Rein Narma, who had operated recording equipment during the Nuremberg Trials and War Crimes Tribunals, as well as in refugee camps. As early as 1948, Silvia was also reunited with the Estonian poet, Henrik Visnapuu who had at one time directed the Sunday cultural magazine for her father’s newspaper. They both immigrated to the United States in 1949, and, with others, established the Estonian Literary Society in New York, which worked to publish Estonian literature in the U.S., including Visnapuu’s final work in 1950. Visnapuu died at the age of sixty-one in 1951. In 1955, Silvia married Juhan Umbjarv, also an Estonian refugee. Together they moved from New York to Braintree, Vermont where they operated a farm and sold eggs. Her brother Rein and his wife Hilja Narma lived nearby. During this time, Silvia’s husband, Juhan required psychiatric care, and was admitted to the Vermont State Hospital in Waterbury, Vermont. Silvia left Braintree and moved to Montpelier, where she lived for many years, until moving to Cabot in her eighties. Silvia died at ninety-six years of age, at her home in Cabot, on November 3, 2014. Among her varied interests, Silvia was a an avid reader and writer, as well as a bookseller of Estonian literature. She was an accomplished gardener and baker, creating exquisite Estonian pastries which she generously shared. She had a particular fondness for all animals, and was attentive and nurturing with small children. Silvia is missed by many, who came to know her in Montpelier, and those in Cabot who cared for her during her last years, as well as those who miss seeing her in her gardens. Rest in peace, Silvia Narma. I love hearing about Silvia and imagine I saw her sometime since I’ve lived in Cabot for 25 years. Thank you for sharing her amazing story. You’re a wonderful writer! It gives me great joy to be able to share Silvia’s story, and I’m happy you are interested in her story as well. She was definitely amazing.